CAIRNS, Australia -- Australian scientists have thrown new light on the mechanism behind the mass death of corals worldwide as the Earth's climate warms. Coral bleaching, one of the most devastating events affecting coral reefs around the planet, is triggered by rising water temperatures. 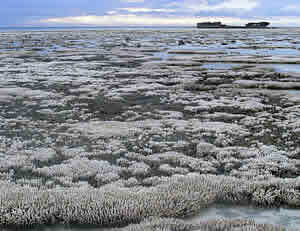 It occurs when the corals and their symbiotic algae become heat-stressed, and the algae which feed the corals either die or are expelled by the coral. There have been seven major bleaching events globally in the past 30 years, the most recent being in 2010 across the Indian Ocean and Coral Triangle. Australia's Great Barrier Reef has suffered eight events since 1980, the worst being in 2002 when 55% of the total reef area was affected. The frequency of these events appears to be increasing. Now a team of scientists from the ARC Centre of Excellence for Coral Reef Studies and James Cook University has shown that a complex cascade of molecular signals leading up to the self-inflicted death of corals and their symbiotic algae is triggered as sea water begins to warm. Working with Acropora corals from the reef at Heron Island, the researchers found the cascade begins at ocean temperatures as much as 3 degrees lower than those normally associated with coral bleaching. And the process culminates in 'apoptosis' or programmed cell-death � a situation in which living organisms (including corals and humans) deliberately destroy their weakened or infected body cells, effectively a form of 'cell suicide' or amputation designed to protect the organism as a whole. "Our results suggest that the control of apoptosis is highly complex in the coral-algae symbiosis and that apoptotic cell death cascades potentially play key roles in tipping the cellular life or death balance during environmental stress prior to the onset of coral bleaching," explains lead author Dr Tracy Ainsworth. "It is also clear that this chain reaction responds significantly to subtle, daily changes in the environment and to sea temperatures which were generally thought till now to have little impact on the function of coral and its symbiotic algae." Paradoxically, the team's research identified molecular signals both promoting and discouraging programmed cell-death in the corals. This has led them to a theory that corals respond to the stresses caused by warming sea water by killing off some of the cells, while strengthening others in order to stage a possible recovery after the hot water has moved off the reef and conditions have returned to normal. "This would explain why some corals are able to recover quite quickly from a bleaching event, if it has not gone too far. "It is far too early to speculate, but understanding the recovery process for any living organism is always a big help, as human medicine has constantly demonstrated, Dr Ainsworth says. "The next step in our research will be to see how we can use this new insight into the processes of coral bleaching to understand their recovery mechanisms. We also need to know more about how this process works at lower temperatures, or under varying temperatures. "That in turn will lead us to explore ways that coral reef managers and users can perhaps minimize other stresses on the reef in order to give it the best possible chance of recovery from bleaching." However the team cautions that "further study of the tissue function and cellular differentiation and recovery processes in coral is needed before this complicated cell death system can be fully understood". The team's paper "Defining the tipping point. A complex cellular life/death balance in corals in response to stress" by Ainsworth TD, Wasmund, K, Ukani L, Seneca F, Yellowlees D, Miller D, and Leggat W is published in the latest issue of Scientific Reports published by Nature.